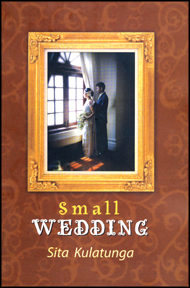 A Small Wedding, the novella by veteran writer Sita Kulatunga though deals with a common place experience of a wedding, has, in fact, captured inevitable socio-cultural changes that occurred in post-independent Sri Lanka. "Stepping on to the *poruwa* Avanti swept the audience with a quick wide glance. She had come down the aisle with her father followed by her close relations. The two grandmothers also walked with a heroic effort. As the drums ceased the old man whom Agbo, Siddhartha and others dubbed ritual uncle took over. The flowers at the entrance to the *poruwa* reminded Avanti the blossoms near her rooms at Cambridge. She broke into a giggle almost forgetting that she was the bride when she spotted her knife uncle. She wanted to point out knife to Siddhartha but the ritual started and she wouldn't as the moment was too solemn. Siddhartha who had been fascinated by uncle Atula's description of knife would have liked to be introduced to knife. But in what language would they communicate? Knife might shake hands or perhaps bring his palms together and say namasthe. Anyway there will be a time to introduce him. I have a feeling that he quite likes me. If he had any little ailment when we were on holiday, it was to me that he came not to my father, mother or brother, she thought, a dubious honour. Avanti was flattered that he sought her. Some of their poor relations wouldn't turn up at their wedding thinking that it was too highflying for them. This kind of fashionable cosmopolitan function was not for them. They would feel out of place they thought. Knife had suppressed all those qualms. What Avanti could not get over was Knife bappa's three piece suit. What a lot of trouble he had taken and how Uncomfortable he must be feeling. From the very first sentence, it is clear that the "Small wedding" would be a meeting place for diverse cultures and dramatic personnel from equally diverse social strata. The bride Avanti is a Sri Lankan though she is educated in the UK where she met Siddhartha. Throughout the novella, the themes such as globalisation, diaspora and change of milieu and loss of inheritance have been skilfully woven into tapestry of narration that takes readers into the forgotten milieu. Avanti and her brother Agbo represent the second generation of diasporic Sri Lankan community. They have little memory of Sri Lanka. They are strangers to their motherland or perhaps, their parents' land. The author skilfully compares the cosmopolitan members of the extended family with their elder counterparts who still live in villages adhering to age-old norms and traditions. The contrast is so wide that most of them cannot communicate with the bride groom because of language barrier. For the older generation, the full suite with a tie seems ill-fitting. Though the venue of the wedding is posh five star hotels in the metropolitan Colombo, most of the members are not upper middle class members. "be quite capable of breaking into the hotel in his sarong and shirt and asking Abaya whether blood relations were given short shrift because suddas took the first place. There were a few whites their friends combining a holiday with attending the wedding; and also few of the couple's friends from Cambridge. What an odd cosmopolitan crowd, Avanti thought. Although the venue of the wedding was upper class, there weren't very many upper class guests. Most of the guests were from the two villages of Kadigamuwa and Berugoda and from the branches of the different families that had spread to different parts of the country. Many of them were professionals, a couple of politicians thrown in. Anyhow the hall was full. Siddhartha whispered in her ear to ask what about a coconut. As we get down from the *poruwa* a coconut would be split in two. "Watch now", said the bride. Just then ritual uncle's assistant pulled out a dirty gunny bag (to save the hotel floor) placed the coconut on it and hit it hard with a manna knife. It was an excellent job. Each half of the coconut retained its share of water. The coconut was split exactly in two. The couple will have long life and a blissful marriage. Siddhartha was bearing with aplomb the long drawn marriage ceremony. But he realized that this was not as long as the Hindu ceremony. Though a north Indian he had not witnessed many Hindu marriages as he was born and bred elsewhere. The two of them had met at Cambridge. Some of Avanti's relatives commented that it was better than marrying a white. Yet others didn't condone marrying a foreigner at all. The first thing that disturbed Avanti's relations was neither racial religious nor geographic but his name. *Ane ammo vas vadinne nadda? They exclaimed. Siddhartha was Buddha's lay name. The Buddha was called Siddhartha Gautama. In this country no Buddhist Hindu or Christian named a child Siddhartha." This is loss of inheritance. For instance, Siddhartha though he is an Indian, is not familiar with Hindu customs associated with marriage like his bride Avanti. Avanti's brother Agbo though educated in the West, loves his motherland and tries to learn about its customs and traditions. Though obvious the device by which the author narrates the socio-cultural life of the past is through biographical notes of an aunt. 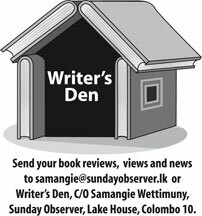 The aunt's diary which occupies a sizable portion of the novella codifies an important facet of cultural life in the post independent Sri Lanka. The author has been logical in selecting the marriage which is centre of norms and customs of the day. Particularly those sections which describe in elaborate terms the minutest details of wedding in the pre-independent Sri Lanka, at times, are like anthropological notes. For instance, the grandma's (Achchi) elder brother gave a lunch to his boss superintendent of the estate he worked describes the kind of preparation that had been made to welcome the European master. The account of the diary in a subtle way marks the gradual change of milieu, particularly reducing the custom-bound restrictions imposed on women. In a slow moving narration, the author portrays the forgotten cultural landscape drawing parallels with socio-cultural changes brought about by globalisation. It is marked for its simplicity in diction and insight into the past. The book is published by Sarasavi Publishers. This publication on "Tertiary Education in Sri Lanka-Relevance in the Global Context" is a follow up of the author's previous publication titled "Higher Education Policy in Sri Lanka: New Perspectives and Change". Like the previous publication this too is based on a lecture series, numbering twenty two, delivered by Prof. Wiswa Warnapala on Higher Education in Sri Lanka. The focus of this publication relates to three important issues that confront higher education in Sri Lanka, namely (a) Technical Education (b) Higher Education Policy and (c) Unrest in the Universities. The focus on Technical Education is very appropriate and timely since it has a direct bearing on the development aspects of the country, as well as, assuring avenues for employment for the large numbers that come out from universities and other higher educational institutes. Competencies in technical skills have been part of the history of the human kind and their development which is now pronounced more than ever before. Today development of a nation is logically associated with the inertias of technical know how. Hence, the importance of this area in the context of modern development in Sri Lanka. In the first of his lecturers speaking on "Technical Education Needs and a New Approach" he traces the modest approaches attempted by the governments since 1956 to foster Technical Education (TE) at various levels with little success. By and large, the universities had neglected TE as a matter of policy although the Ten Year Plan in 1957, the first of its kind in Sri Lanka, had been very specific on the importance of technical and scientific education in the development of the nation. He traces the history of TE from the 19th century which saw the establishment of the Ceylon Technical College in 1883, on a very modest footing, to the current well organised umbrella organizations, namely, Sri Lanka Institute of Advanced Technical Education (SLIATE) and Tertiary and Vocational Education Commission (TVEC). SLIATE provides many needs of the industry in the country through provision of skills and courses catering to the needs of the region and keeping abreast of the new millennium development goals. All institutions dealing with technical and vocational education have to register at this apex body, TVEC However, there is much to be desired in the connections between the industry and training programmes. Professor Warnapala laments on the flaws and draws attention of those responsible professionals to look into these lapses. Realising the urgency Prof. Warnapala proposes the need for (a) modernization of TE (b) provision of facilities and expansion of TE to rural areas (c) collaboration with the needs of the industry (d) moving away TE from the traditional elitist higher education policies and practices and (e) encouraging private sector organizations to assist in developing TE, as is seen in the current policies of many of the Asian countries. Professor Warnapala very eloquently argues the need for change in the directions of education in general and higher education specifically. "Free Education" was the need of the hour in the 1940's and this has resulted in an upsurge of more students receiving education over the years. But he rightly questions the wisdom of this policy in the present context and strongly advocates "education for development specifically, development - oriented Higher Education Policy". This, he argues, would certainly augment and underscore our system to be competitive internationally. Thus the current "social demand model" of education has to be transformed into a "development-oriented Higher Education Policy". Arguably this is very sound and far thinking approach to development. Prof. Warnapala laments that the present day evils in Higher Education are possibly results of (a) over expansion of universities with out quality (b) focusing only on undergraduate programmes (c) lacking focus on the post-graduate education sector, (d) over politicalisation of student community and (e) the absence of relevance of the curricular to social and development needs of the country. Hence he suggests the need for the establishment of a policy unit on higher education at the MOHE to rectify these anamolies. This publication provides insights to the pitfalls of following policies without planning and provides the policy makers' guidelines as to how these gaps could be avoided. The ideas expressed in this series of articles do expose the follies of the general educational system as well. Set against the pastoral landscape of Japan filled up with exotic Sakura, Sumithra Rahubadde, perhaps, for the first time, explores an unknown territory in the Sinhala novel which carries the readers into rural agrarian Japan where farmers take foreign brides since Japanese women refuse to marry them. Young women from Philippine and Sri Lankan endure the hardships of farming life in Japan. In 'Kandak Sema', Sumithra, for the first time, depicts another glory aspect of globalisation where innocent lives of the poor became phones in the hands of crafty middlemen with political patronage. They (middlemen) sell young women to old Japanese men for a prohibitive sum, staging mock weddings in Sri Lanka in order to fulfill visa regulations. In the face of mounting hardships in Sri Lanka, the young women from poverty stricken families, agree to the deal with the intention of escaping from ruthless poverty and to lead, at least, a decent life in Japan. However, what they experience in Japan is not the industrial highly developed Japan but rural agricultural Japan. 'Kandak Sema' (Like a Mountain) is the latest novel by Sumithra Rahubadde. Novel among other things, exploits heroic struggles of a Sri Lankan young woman from an impoverished family in search of her deprived youth in estrange culture. Nupa is a young girl who marries an old Japanese farmer out of desperation to escape from poverty in Sri Lanka. A young politician is engaged in a lucrative business of supplying Sri Lankan maidens to old Japanese men, especially from Neegatha. Since the Japanese women refuse to marry these farmers in Neegatha, the old farmers marry foreign women mostly from Philippine and Sri Lanka. Nupa marries Masaya San, an old Japanese famer from Sumikawa clan. Masaya turns out to be an emotion-less derailed man who is haunted by fond memories of his ex-girlfriend. Nupa San, somehow, gives birth to a daughter, Kasumi by Masaya Sen. Before Kasumi' birth, Masaya San retires from his job and commences writing petitions to Government officials on imaginary issues. The couple depends on a meager Government's allowance. From the very beginning of the story it is clear that the couple is a mismatched. They do not communicate with each other the way that a husband and wife should be. Nupa San without knowing a word of Japanese tries hard to mater the language. The story is woven around the heroic struggles of Nupa San to overcome odds she faces in Japan and in adapting to a new culture. She is roaming in the city of Sanjo in search of her deprived youth. Intersperses with magnificent descriptions of Japanese rural life and its cultural landscape, the author has skilfully created a complex character of Nupa. The story is narrated from Nupa's perspective. The author has used down-to-earth readable language with appropriate idioms for the subject. Nupa's family is a prototype tragedy of impoverished social segments of Sri Lanka. Nupa's character matures through hardships, betrayals in conservative Sri Lankan setup and in rural Japan. The adverse effects of globalisation and erosion of social institutions such as marriage, once held sacred is part of the sub text of the novel. Mass marriages are held to wed Sri Lankan maiden to old Japanese who have paid handsome sums in return for brides. The marriage is performed according to Sri Lankan rites. However, till the bridegroom comes, the prospective bride and her parents have to wait outside the hotel. The purpose of this rather mock marriage is to take snaps of the couple and to register the couple in Sri Lanka. Snaps are given to the Japanese Embassy in Sri Lanka. The marriage broker in this instance is a young politician with ambition to amass wealth by hook or crook. The establishment is corrupt to the core. Money by any means seems to be the motto of a generation in a highly competitive globalised set up. Owing to conservative values, Nupa is compelled to carry out two abortions, one in Sri Lanka at the age of seventeen and another in Japan. Though the circumstances surrounding the abortions may differ, the primary issue remains the same. The abortion is done in order to avoid social stigma attached to it. The archetype attitudes of Sri Lankan society on abortion and children born out of wedlock have not been changed. The society still refuses to accept a woman with a child born out of wedlock irrespective of social standing of the woman. In such a hostile environment women are compelled to carry out abortions. The detailed descriptions of the Japanese society, its cultural life and places of interest such as historic temple in Neegatha are born out of author's month long stay in the province and numerous visits to the sites which subsequently became part and parcel of the setting. It seems that author has done an extensive research not only on the Japanese culture but also the lives that Sri Lankan women married to Japanese citizens. Author describes the kind of hide and seek -life that Sri Lankan illegal immigrants lead in Japan. It is a life of austerity fraught with the danger of being caught by the Japanese police. However, Sri Lankan young women married to old Japanese men, seek liaisons with young Sri Lankan illegal immigrants in search of true love; for both physical and spiritual nourishment. The spiritual aspect of love is being depicted through Nupa's character. Nupa is, in fact, in an endless journey in search of her true love, an ideal love in her mind. Her perception of love is rather a blend of carnal and spiritual love. Since she does not receive it from rather passive husband, she is roaming the city in search of the ideal love. One of the salient features of the novel is a subtle use of symbolism. Masterly use of symbols such as Sakura is prominent to the theme of the novel. In a one context, Sakura is a potent symbol of prosperity and aesthetic beauty of rich Japanese cultures and in another, it is a symbol of uncompromising conservative Japanese society. For Nupa's family in Sri Lanka and most of the Sri Lankans, Sakura is a symbol of prosperity but for her it is symbol of austerity. Author in a clever manner has virtually inversed the meaning of Sakura in a particular context. The book is marked for its remarkable characterisation and its dealing with complex issues, perhaps, in most unassuming manner. Learning English Book II is the second in a series of graded English Language Teaching core textbooks, taking into account recent advances in the field of ELT and based on long practical experience as well. It caters specifically to the needs of Sri Lankans and is ideal for those preparing for examinations. The second book is meant for older children and adults at intermediate level. The authors, two university teachers with proven ability and rich experience, have pondered the book long and carefully and have always borne in mind both the teacher and student in preparing the lessons. They have adopted an integrated approach and the basic skills of Reading, Writing, Speaking and Listening are taught, and are to be acquired, simultaneously. They care for both accuracy and fluency in the use of language. The book will be a pleasure to use and learn from. The authors have deployed a whole range of teaching strategies from reading passages to pair and group work, to poems and songs, crossword puzzles and illustrations. The grammar builds on and extends the usages taught in Book I.
D.C.R.A. Goonetilleke, Emeritus Professor of English, University of Kelaniya, is an academic of both national and international renown. Mona Gooneratne was Senior Instructor in the English Language Teaching Unit, University of Kelaniya, and is recognized for her expertise in ELT. 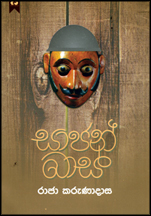 Raja Karunadasa's latest Sinhala novel 'Sajan Baas' will be launched at Dayawansa Jayakody Book Exhibition Hall, Ven. S. Mahinda Mawatha, Colombo 10 on Tuesday, October 6. "Devena Sithata Budu Dahama", written by Ven. Wekada Bhadra Thera was launched at the Sooriya Bookshop recently. The book deals with Bodhi Pooja, Buddha Vandana, Buddhanussati Bhavana, Mettanussati Bhavana, Marananussati Bhavana, Ashubha Bhawana, Satara Sathi Pattana Bhavana, Anapanasathi Bhavana and several other topics. The book is useful for those practising Buddhist meditation.